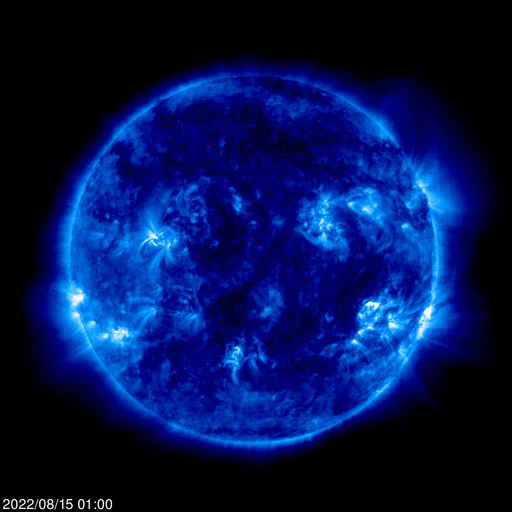 Current Solar Flare Activity provided by NOAA / Space Weather Prediction Center - Current image from the Solar and Heliospheric Observatory EIT (Extreme ultraviolet Imaging Telescope) images the solar atmosphere at several wavelengths shows solar material at different temperatures. In the images taken at 304 Angstrom the bright material is at 60,000 to 80,000 degrees Kelvin. In those taken at 171 Angstrom, at 1 million degrees, 195 Angstrom images correspond to about 1.5 million Kelvin, 284 Angstrom to 2 million degrees. The hotter the temperature, the higher you look in the solar atmosphere.